University School of Visual Arts. and Tucson Plein Air Painters Society. "Each painting I do springs from an idea I have about my subject. I'm not a formulaic painter, meaning I don't use the same approach for each painting I do. This is a sometimes risky way of working, but it's what keeps my love alive for the process. I feel like I can never learn it all, so each new day is an opportunity to challenge myself to grow in new directions. The end result hopefully, is painterly, with great color, light and drama. I hope to catch your eye and make you think differently about the scene, and perhaps, about painting." 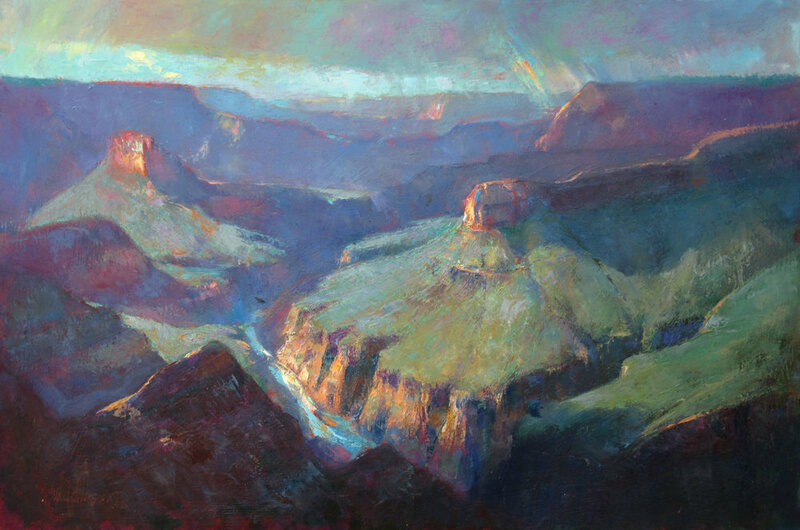 Cody is a founding member and former Vice-President of the Arizona Plein Air Painters, and is a core member of the Jerome ArtWalk Association, and Jerome Chamber of Commerce, and has been a cornerstone of the Jerome arts scene for nearly two decades. I have been an oil painter since high school. I knew I wanted to be an artist from an early age and I was always sketching, drawing and coloring. In high school, a teacher encouraged me to explore my passion. He gave me an old set of oil paints as he was exploring the "new" acrylics and I immediately liked them and their textural qualities and the slower drying time which allowed them to be worked and added to. After attending Utah State University for one year trying to find myself, I transferred to the University of Utah where I met and immediately admired the work of Alvin Gittins . He became my teacher and mentor for the next 5 years. After receiving my Master of Fine Arts degree in 1977, I moved to Los Angeles to search for a gallery situation and I was fortunate to be picked up by Wally Findlay Galleries in Beverly Hills. They were especially interested in my still life works which became the bulk of my sales for 15 years. I had dabbled in outdoor work since high school and I continued to be interested in impressionism and in working "en plein air" and gradually this desire for the free, wide-open spaces became my passion and I worked to be good at it, finding new sales venues at Redfern Gallery in Laguna Beach, John Pence in San Francisco, Medicine Man Gallery in Tucson and Santa Fe, and more recently at Garland's Collector's Room in Sedona. I have always loved to travel and see new places and paint these locations, some of them quite remote and difficult to get to. Pack trips into the High Sierras in California and the Wind River Range in Wyoming come to mind, as do river trips through the Grand Canyon in Arizona, as well as extended stays in Spain and Italy. 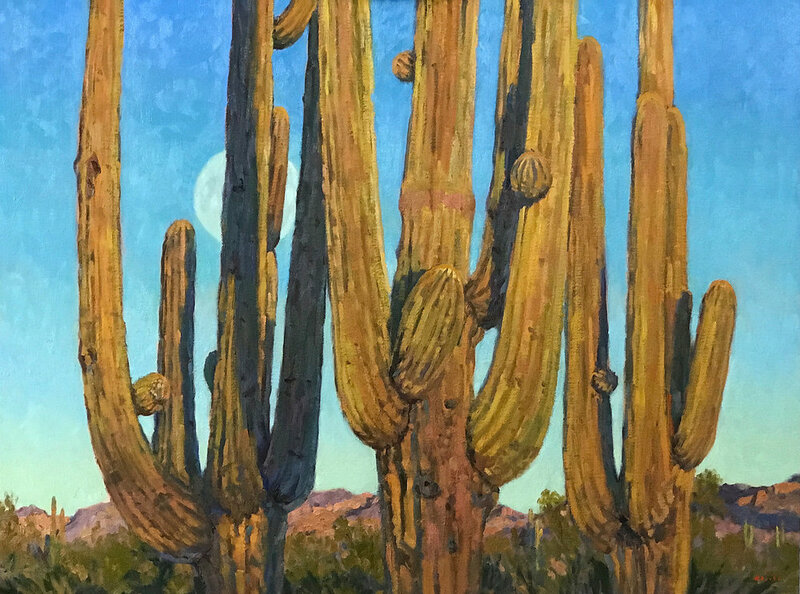 One of the country's top plein air painters, Michael Chesley Johnson paints primarily outdoors in pastel or oil, choosing locations from the American Southwest, Downeast Maine and the Canadian Maritimes. He has been invited repeatedly to challenging national plein air events such as the Grand Canyon National Park Celebration of Art. Michael was awarded Master Pastellist status by Pastel Artists Canada in 2008, and he is a Signature Member of the American Impressionist Society, the Pastel Society of America, and the Pastel Society of New Mexico. His paintings have appeared in many magazines and are in both corporate and private collections. He was featured in The Artist's Magazine in September 2013. Michael is a nationally-known teacher, giving workshops across the U.S. as well as seasonally in Maine and the Southwest. A frequent writer for both The Artist's Magazine and Pastel Journal, he is the author of several books, including Outdoor Study to Studio: Take Your Plein Air Paintings to the Next Level and Backpacker Painting: Outdoors with Oil & Pastel, all of which are available on Amazon.com. He has many videos available, as well. Michael maintains a summer studio on Campobello Island, New Brunswick (Canada), and a winter studio in New Mexico. Julie is the author of three North Light Books, Discover Oil Painting (2016), Watercolor Unleashed (2013) and Brilliant Color (oil & acrylic, 2009), plus nine videos for North Light/ArtistsNetwork.com (three Watercolor Unleashed, four Oil Painting Unleashed and two Acrylic Unleashed). Additional publications include various articles and book inclusions including most recently Watercolor Artist (April 2018), Splash 18 (2017) and AcrylicWorks 3 (2016). She has given instruction in watercolor and oil since 1985 in numerous venues such as La Romita School of Art in Umbria, Italy; Cheap Joe’s Art Workshops in North Carolina; Beach Art Group in Panama City Beach, Florida, Saanich Peninsula Arts and Crafts Society in Sidney, B.C., Canada and Vale do Lobo in Portugal. Current (2018) venues include, among others, Scottsdale Artists’ School, Shemer Arts Center and Sedona Arts Center in Arizona; Coppini Academy of Fine Arts in San Antonio, TX and Sierra Watercolor Society in Reno, NV. A frequent award winner, Julie’s oils and watercolors have hung in numerous juried and gallery exhibits, including in 2018, 9th Annual International Signature American Watermedia Exhibition, Fallbrook Art Center, CA. 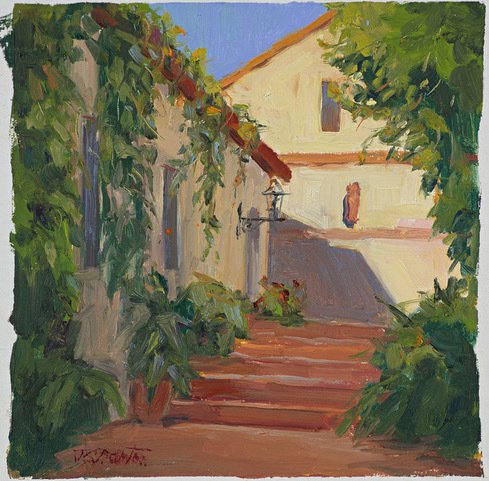 Most notable awards: Best Impressionistic Painting in Best of America, National Oil & Acrylic Painters’ Society, 2012 and Best Use of Light & Color in Best of America, National Oil & Acrylic Painters’ Society, 2011. She is a signature member of the National Oil & Acrylic Painters’ Society, Arizona Watercolor Association and San Diego Watercolor Society. Her work is included in many private and corporate collections and is represented in Arizona by Esprit Decor Gallery in Phoenix, Raku Gallery in Jerome and Sedona Arts Center Gallery in Sedona.